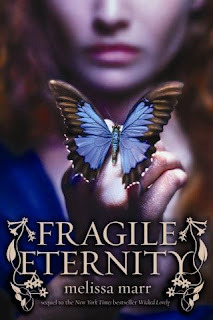 For those unfamiliar with or new to the series, Fragile Eternity is the third book in Melissa Marr's Wicked Lovely world and the long-awaited direct sequel to Wicked Lovely itself. The painful and beautiful Ink Exchange was more of a companion novel toWicked Lovely and followed Aislinn's friend Leslie. Fragile Eternity picks up shortly after the end of Ink Exchange and divides its time between the four original principals--Aislinn, Seth, Keenan, and Donia. All of them are struggling to deal with the consequences of their actions (or, in a few key cases, inactions), which resulted in Leslie walking away from it all and Irial abdicating his throne, effectively forcing Niall to fill his deep, dark shoes. 1. Aislinn working really hard not to touch Keenan with a ten-foot pole. Bad things happen in the castle when she does. Mostly for Seth. 2. Keenan working even harder to do a lot more than touch Aislinn. All in the name of his court, of course, but still. You are starting to really piss me off, Summer King. 3. Seth alternating between the Pit of Despair and fighting the good fight to save his lady from a fate worse than death, a.k.a., Keenan. He's worked so hard to be good, but he's still so freaking mortal. 4. Donia growing more and more like Beira with every falling snowflake. It's hard to blame her. After all, she's in love with an insufferably arrogant faery who seems bent on destroying her court and trampling her heart. Not necessarily in that order. You'd be cold, too. The interesting thing about Fragile Eternity is that the most compelling characters are not those four. Everyone's fate seems to hang on them, yes, but it's the peripheral characters who steal the show. First of all, Niall. I have no words for how awesome the Dark Lord is. With the flapping coat and the brotherhood with Seth and the freedom he inhabits as the leader of the dark fey. Is it me or does it take embracing evil to see clearly in this world? Irial felt the same way to me and, though I have loved Niall in all his forms and allegiances, I think this incarnation may be my favorite. Second, Sorcha. The queen of the High Court and the most remote of faeries, I thought I would find her tedious and cruel. Instead, she stepped right off the page and the scenes with her and Seth tugged at my heart and made me look forward to more from her in the fourth (or fifth) book. I'm actually a little worried for her, which just goes to show how Marr was able to lend a certain humanity to a faery who goes out of her way to avoid conversing with humans. And third, Sorcha's younger brother Devlin. Devlin is Sorcha's enforcer and all around scary guard. He has a weird and potentially extremely problematic bond with both his sisters, Order and Chaos, and I feel absolutely certain he will play a larger and more important role in books to come. So while all four of the main characters annoyed me at times (I now officially repudiate Keenan), these three peripherals delighted me to no end and from the moment Seth meets Sorcha I hit the point of no return and had to read it straight through to the finish. The awful, exciting, invigorating finish. Can't wait for the next one, Ms. Marr. Oh, yes I agree with you 100% on Nial and Sorcha. How I love them. Ash annoyed me but I LOVED Seth, loved reading POV finally and what he's done. as for Keenan - I hate the guy. Although that last scene between him and Donia? amazing. Gosh, Melissa Marr is such an amazing writing. Hi Angie. I just found your blog today - and as you can see, my name is Angie too, and so naturally I'm totally loving the name of your blog (and wishing I'd thought of it first :). Aislinn is annoying, but I do love Seth. I hate Keenan and sort of think he and Aislinn deserve each other. I also love Niall and loved Irial (can he please come back) I also like Sorcha and Donia. I just hate the summer court, I guess. Amy, yep, yep, yep. Irial is welcome back any time. I just found your blog today, and am enjoying it. I keep hearing about the Wicked Lovely series, and need to bump it up on my To Be Read list... Thanks for the review of this book. It's funny. We all seem to have different favourites. I still really like Irial, he stays my favourite character. I wasn't much interested about Niall, I found Aislinn too melodramatic (why does she seems to think her friends will suddenly stop dead now she is immortal ? ), I was ok with the Winter queen, I grow fonder with Keenan mostly because nearly everyone seem against him when he didn't do anything wrong while I didn't know what to think of him before and I hate Seth, this guy is too good, too perfect so he annoys me, nice and friendly, even that one fairy king and two fairy queens really like him... ok maybe not perfect, he dared to say Keenan was at fault for Seth and Aislinn's separation when the human was the one to choose it. A so responsible guy !